Dr. Bryan Greenberg graduated from UMASS-Amherst with a Bachelor's degree in Animal Sciences. He went on to pursue his veterinary degree at the University of Ross in the beautiful caribbean island of St. Kitt's. When he returned to the states, he completed his clinical rotation at Tufts University. 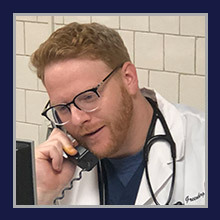 Dr. Greenberg then went on to complete a rotating internship in small animal medicine and surgery at the Veterinary Medical Center of Long Island. Dr. Greenberg not only enjoys emergency medicine, but has an interest in exotics. In his spare time, he enjoys music, sports, and caring for all of his farm animals which include dogs, chickens, mini horses, peacocks, ducks, and swans.